The Strangle knot is a simple binding knot. Similar to the Constrictor knot, it also features an Overhand knot under a riding turn. The difference is that the ends emerge at the outside edges, rather than between the turns as for a Constrictor. 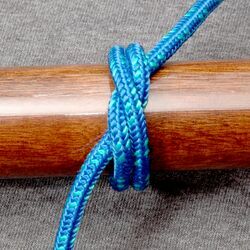 This knot is actually a rearranged Double overhand knot and makes up each half of the Double fisherman's knot. This page was last edited on 27 December 2009, at 00:00.